So far the most fun I've had has been whilst staying at Koh Phangan! I really didn't expect this as all I knew is that it's a complete party island because of Full Moon! But I can honestly say I've had the best time here. And begun our long trip to Koh Phangan - boat, bus and another boat - leaving at 10.30am and arriving around 6.30pm. Luckily for us, the Manchester boys were doing the same journey so it sped the journey up a little. My favourite mode of transport is, without a doubt, by boat - sea breeze, sitting on the top deck, dangling your feet over the edge, basking in the sun - much better than a sweaty train or bus. longer than expected...or both. So we didn't get there until around 7-7.15pm. We arranged to meet the boys at their hotel later on, go for food and hit the pre party on the beach. Luka and I found a place a few months back called Mem's place. 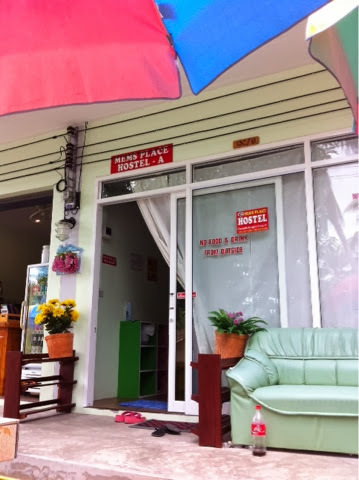 We started looking for Phangan hostels as I'd been told that they fill up so quickly because of Full Moon and the rumours were true - everywhere was booking up! We looked online and found Mem's Place; although it was a 15-20 minute tuk tuk away from Haad Rian (Full Moon Beach), we decided this was okay. 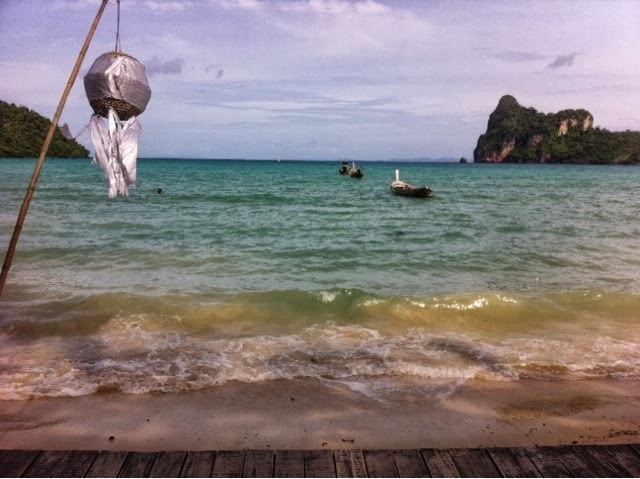 The problem with Koh Phangan is that everything is expensive because they know people will pay the high prices. We ended up paying around £5 or £6 per night (three nights) for our accommodation which, with tuk Tuks, made it quite expensive unfortunately! Note: the above isn't our room - it's the same style but we had a literal box took behind the wall. 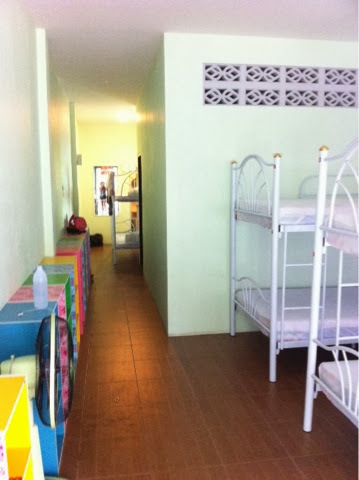 So, somehow, the room was smaller than our Phi Phi hostel room at Blanco. Still fan assisted, although seemingly cooler but the place was sooo much cleaner, sand free and thankfully not completely full so we could leave our bags outside our room and toiletry bags in the next room. This made it much easier - had it been completely full it would have been a nightmare! We showered, got ready and down to meet the boys at their hotel - The Drop In Resort. Mem has her own taxi so that was very handy and only cost us about 100 baht each. Which, although expensive, meant air con and a relaxed journey. The boys resort was as lavish as expected - nice, big rooms, 3 pools. So ideal for those splashing out or holidayig but for backpackers, it would be a little too much. Nice all the same and I'd have loved to be there but Mem's was more than ideal. 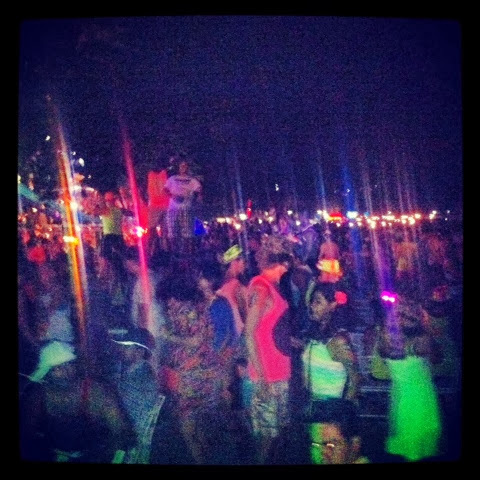 After that, we headed down to the beach for the pre party. In Thailand, most places will serve you drinks in a bucket - this actually originated here because of Full Moon! So we grabbed a few buckets and headed down to the beach. It wasn't half as busy as I anticipated - Thailand is pretty much on downtime at the money now everybody is back at university but I think it makes it nicer as it's not got it's usual overpacked-with-English hustle and bustle. We had a pretty chilled night, bumped into a couple of girls we had met back in Bangkok and woke up the next morning hangover free. Now is where the fun started - mopeds! I had never done this before (and promised my parents I wouldn't - sorry!) but it had to be done. Hiring mopeds is the cheapest and easiest way to get around - it cost us around 500 baht for two days. 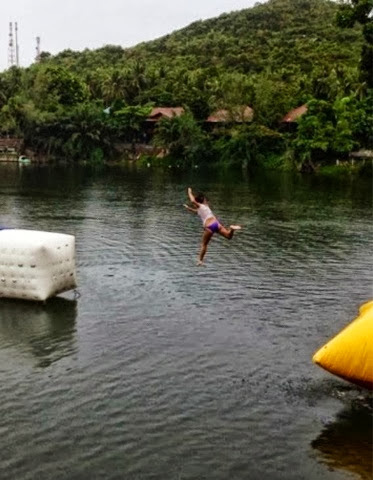 And we definitely needed them for our next activity - Total Wipeout Phangan. 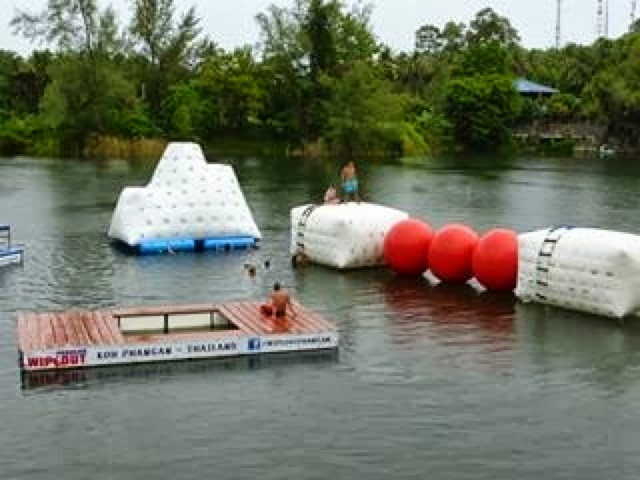 Yep, as in the Total Wipeout with the red balls that's completely crazy - yep, we went there. The course was great; not quite as big as we'd hoped but man, we were tired when we had completed it! It took us around 20 minutes of watching other people before we plucked up the courage to pay our fee and get out little orange string wristbands. It cost around £10 to do it but it was well worth it. I realised during this that I have a lot more upper body strength than I realised but it was still hard work (more pictures on my Facebook if you fancy a browse). 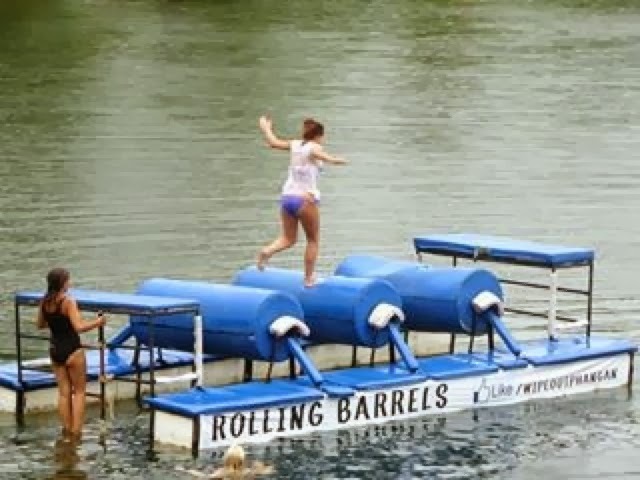 You started by swinging off a bar into the water, climbing over some inflatables, monkey bars (which I fell off after about one bar), the rolling barrels, climbing up and sliding down then climbing up for the red balls - which nobody could complete. Absolutely hilarious! I winded myself a bit and bruised my leg but I would so do it all over again. 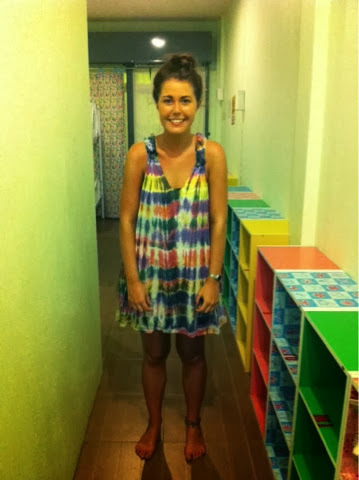 Such a fun experience that I would, without a doubt, urge anybody visiting Phangan to do! Pictures were taken by the staff there and a video which will be up later in the month and I can't wait to see! After that we hopped on our peds and headed for a nearby shop to get beats/dresses and face paint for Full Moon. Another instance of being ripped off; they know you'll buy these things so charge a high price! 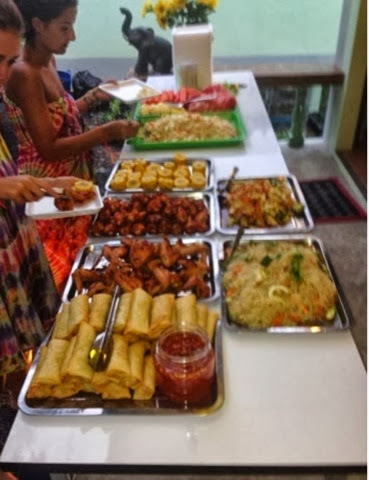 Mem was doing a barbecue at our hostel that evening and charging 350 baht (around £6) for food and a taxi to and back from the beach - bargain! She was also selling buckets for 250 baht (£5£ buy they were much bigger, stronger and safer than those sold down by the beach. So we headed down to meet the boys at theirs for pre drinks and face painting! After 45 minutes or so we headed out to beach, all feeling a bit wobbly! Compared to last night, the beach was rammed; not quite as busy as we anticipated but still, very busy! The atmosphere was totally different to the previous night and everybody was chatting away! We met so many different people and had such a good time. We headed back late and luckily made Mem's pick up tuk tuk! Hooray! thanks to Katie I have to admit, serious rounding up skills! The next day was mostly spent in bed, relaxing, recovering and planning our two day journey to Siem Reap (Cambodia). We met the boys for a farewell dinner after the scariest journey ever on our mopeds (parents, look away!). The hills from our hostel down to Haad Riad were ridiculous - so steep - an effort to get up, needing full revs and so scary to drive down, to the point it felt like our brakes were failing. We got there, a bit wobbly and sat down to eat. They were also playing Django in the restaurant, a film I hadn't yet had chance to see so that was an added bonus. The food was tasty, it was greet to be able to say bye to the guys and Django was AMAZING! We mentally prepared for the journey back, which actually ended up being less scary as we took it steadier and devised more of a system with the hills. We got back and practically fell into bed! The next leg from phangan is about two days travelling - boat, bus, another bus, train, taxi, tuk tuk - basically, every method of transport you could get besides elephant! But the total cost is about £40! Bargain. Sooo excited to get to Cambodia!